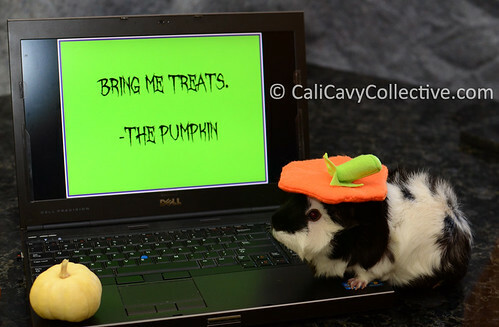 A costumed Revy helps to share her favorite guinea pig (and some non-guinea pig) related links from October. Doesn't she make a convincing pumpkin? I love how this guinea pig print pillow is made up of dozens of tiny pigs in different markings and colors. Watch a video of rescue volunteer Scott on a mission to transport adoptable wheekers from LA Guinea Pig Rescue to Wee Companions Small Animal Adoption. If you're a Google+ user, add me to your circles to keep up with the piggy posts! Sewing tutorials for your piggy: fleece tent and quilted cozy. I haven't personally tried these but they look promising. I've been a fan of artist Lesley DeSantis' illustrations for ages - and now she has an entire cavy care ebook that is filled with them! Check out The Guinea Pig Guide. Psst.. sign up at the bottom for a sneak preview. A recipe for savory mushroom and Brussels sprouts pasta. Delicious. First of all, I am so glad I am not the only one with rebellious guinea pigs who can't even learn how to turn in circles....what relief! I gave up after a solid 6 weeks of "training" where I mostly got beaned on and they got free treats. Psh. That guinea pig pillow is way too cute! And...kinda matches the orange rug I have ;) time to spruce up the new place, perhaps?! I have had my eye on that tent pattern for a while...I can't resist small, cute things and it would be even cuter with piggy chubs flowing out of it!